Every now and again you find something on the App Store that brings a smile to your face because you know it’s new, it’s different, and it does something that no other app has done before. Hueless is a one dollar black-and-white camera app that meets all those criteria and more, and after just a day of shooting with it, I think I’m in love. Hueless claims to be “the first real black and white camera for iPhone”, basing that claim on its custom-built image capture architecture. It declares itself, proudly, a “photo shooting app” rather than a “photo effect app”. Crucially, what you see on the screen when you hit the shutter button is the exact image that gets saved to your Camera Roll. No post-processing is required. There are no image editing controls whatsoever, because all your image editing is done live, in situ, before you take a picture. The keen photographers among you might be starting to take an interest at this point. Along the bottom of the viewfinder is an exposure slider, and at one end of it a filter control. 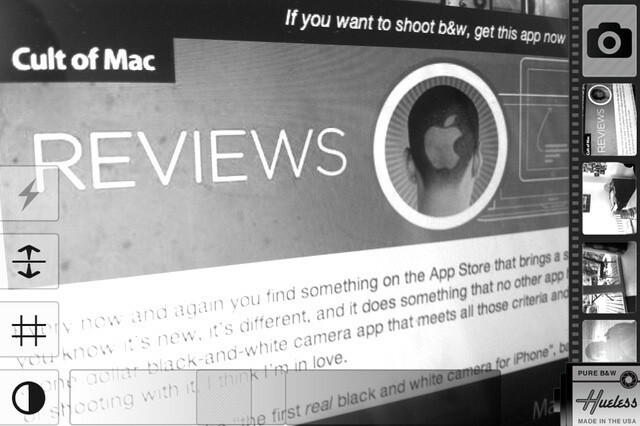 Hueless comes with red, yellow, blue and green filters to give you more creative control over your images. Adding a red filter, for example, darkens bright blue skies for a more dramatic image. Note that these act like true filters, altering the final black-and-white image; they are not pseudo filters that add a color rinse effect to your image. With the filters, exposure slider, and the tap-and-hold focus control, Hueless feels very different to other camera apps. But that’s its strength. Remember that there is no post-processing; there is only pre-processing. You decide what image you want to capture, given the light conditions you’re shooting in. It takes a little getting used to, but it’s worth it. The results are fantastic. Hueless saves full-resolution images (the exact size will depend on which device you’re using) directly to the Camera Roll. There’s no fiddling about with albums, no fiddling about with frames and effects and textures and all that waffle. There’s no fiddling about at all. Hueless is fabulously, fantastically fast. It opens faster than many other camera apps I’ve tried, and it’s ready to take another picture after about 2 seconds (on my iPhone 4 – this will probably be much faster on a 4S). It’s been a long time since a new camera app had me grinning like an idiot and choosing to take my iPhone out for a photo walk rather than one of my proper cameras. But Hueless has managed just that. It is an excellent little photography app and just earned itself a place on my iPhone’s dock. Recommended. Con: None that I can find.